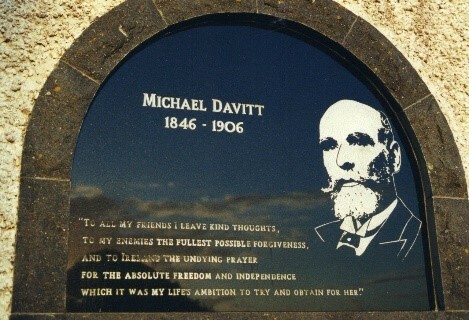 Michael Davitt, 1846-1906: Michael Davitt, Irish Republican, Fenian, LaborLeader, Member of Parliament and Agrarian Campaigner founded the Irish National Land League to agitate for land reform. His efforts lead to several land acts one of which (Land Act of 1881) finally granted “the three Fs” – Fair Rent, Fixity of Tenure and Free Sale. He was born in the Village of Foxford, County Mayo. This monument is located at Straide Abbey, not far from Foxford. 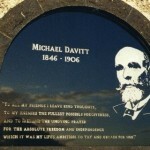 Also on the grounds of the abbey is Davitt’s grave and the Michael Davitt Museum.